Mills County, located in central Texas, is surrounded on the north by Comanche County, on the east by Hamilton County, on the south by San Saba County and Lampasas County, and on the west by Brown County. Mills County. Formed from Brown, Comanche, Hamilton and Lampasas counties. Created March 15, 1887. Organized August 30, 1887. Named in honor of John T. Mills, 1817-1871, Judge of the Third and Seventh Judicial Districts in the Republic of Texas. 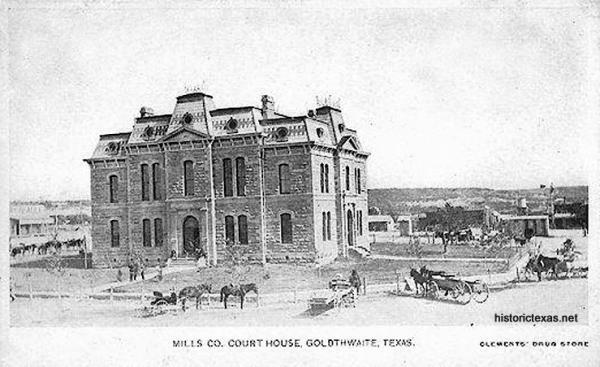 Goldthwaite, county seat. – Historical Marker Text. Marker erected in 1934, on the Mills County Courthouse grounds. Mills County-The Way it Was, 1976, by Hartal Langford Blackwell. A No Man’s Land Becomes a County, 1958, by Flora Gatlin Bowles. Mills County Clerk Records, 1841-1985 online at familysearch.org. Records of the Mills County Clerk including births, marriages, deaths, court records, deed records, divorce records, naturalization records, probate records, and indexes for each of these record sets. Over 150,000 images. Mills County Births 1926-1934 online in the USGenWeb Archives. Mills County Deaths 1964-1984 online in the USGenWeb Archives. Mills County Marriages 1966-2002 online in the USGenWeb Archives. Mills County Divorces 1968-2001 online in the USGenWeb Archives. Mills County Affidavit for Marriage 1893-1906 online at the Mills County TXGenWeb.